Aeroprobe’s Micro Air Data System (μADS) is used by Fraunhofer-Gesellschaft, a German research institute, in the SmartBlades 2 project to measure the aerodynamic behavior of rotor blades for the wind energy industry. The use of Aeroprobe products in the project was organized by Althen, Aeroprobe’s distributor in Germany. 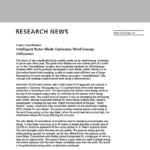 The SmartBlades 2 project seeks to investigate a number of technologies for the development of intelligent rotor blades that can be operated during high-wind environments and overcome the challenges associated with bending-torsion coupling (BTC). These improvements will facilitate higher energy yields in fluctuating conditions. In order to test new structural and active control mechanisms, researchers need to be able to demonstrate the functional capability of smart blades on an operating wind turbine, validate the simulation tools of the rotor blade design, and determine the future potential of blade technologies over a 6-month continuous test run. Aeroprobe’s μADS was able to provide a rugged solution capable of operating in harsh conditions. Two complete μADSs, composed of Micro Air Data Computers (μADCs), Micro Purge Systems (μPSs), and Heated Air Data probes (ADPs), were placed in a 20-meter rotor blade on a wind turbine. The system determines the aerodynamic behavior of the blade by measuring the relative wind speed and angles in front of the rotor blade’s leading edge. The μADCs use an ethernet connection to send accurate, real-time data to controllers on the ground in Colorado and to the research center in Germany. The precision data provided by the μADS is crucial to the success of the SmartBlades 2 project. Aeroprobe’s small, lightweight system is able to overcome the weight and size limitations of a wind turbine blade without sacrificing accuracy or efficiency.